A construction contract is a legally binding agreement between parties. It outlines the type of construction that will be performed (including all of the required activities) as well as the costs for doing so. Generally, it will also include a timeline by which certain parts of the job should be completed. It may also include information such as when payment can be requested. A clearly written construction contract can save the parties involved a lot of hassle and money since the responsibilities and timeline are documented within the contract. A construction contract is a legal document that is used to describe the services and costs associated with a construction project. A construction contract could be used for a home or business. Depending on the client, a construction contract will contain different information. For example, a residential contract will contain different information from a commercial construction contract. All construction contracts should detail the project scope, construction schedule, and payment schedule. A construction schedule is an timeline that includes milestones for completion of the construction process, projected dates, and an estimated completion date. A payment schedule should include the estimated total cost of the project, instructions on how and when payments should be sent, and whether or not a deposit is required. 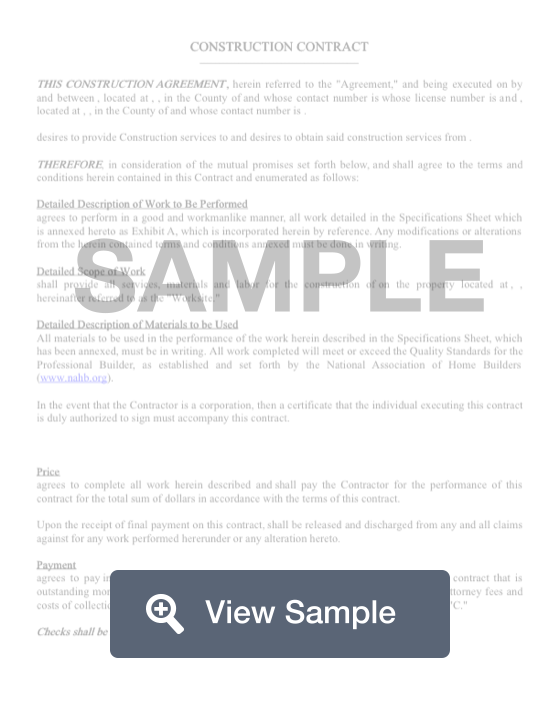 Create a free Construction Contract in minutes with our professional document builder. Do I need a construction contract? A construction contract is necessary if you are building, renovating, or altering a building or structure. A construction agreement protects both parties. If you have just decided to build your dream home, a construction contract will protect your interests in case of unreasonable construction delays and material shortages or your contractor surprises you with unexpected high costs. If you’re a contractor, the construction contract will act as your guide to handling any unexpected issues before construction is complete. The construction contract allows each party to detail the exact work to be performed and the responsibilities of each party during the course of the project. The construction contract also specifies the payment terms of the contract. All contract terms must comply with applicable laws. The consequences of not using a construction contract can be severe. If you’re an owner, what do you do if your contractor suddenly stops working on your home? Or demands excessive payment for materials and labor that you did not originally agree to? If you are a contractor, what do you do when an owner refuses to pay you after you’ve completed the work? A construction contract that details your agreement in writing will protect the rights of both parties. A successful construction project requires clearly defined agreement about all expectations. When there are mistakes or delays, both parties are affected. Owners will be unhappy because they cannot use the property for the intended purpose when they expected. Contractors will be incurring additional costs for labor and use of equipment. An owner can protect against delays in construction by including a liquidated damages clause in the construction contract. Liquidated damages are an agreed upon amount that a contractor will pay to the owner for each day that a construction project is delayed. Agreeing to liquidated damages ahead of time can save both parties the time that it would take to litigate damages later in court. For a court to uphold liquidated damages, the owner’s damages must be uncertain or difficult to determine ahead of time. For an owner to recover liquidated damages, the delay in construction cannot be due to circumstances beyond the contractor’s control, such as extreme weather or change in the scope of work. The amount of liquidated damages must be reasonable. Owner - Who is hiring the contractor. General Contractor - Individual or construction company that is responsible for the oversight of the construction. License Number - The general contractor’s state license number. Work site - Where the construction is to be completed. Project Description - A detailed description of the work and construction to be completed by the contractor. This can also include project plans and specifications. Contract Price - The total price to be paid for the project. Payment Basis - When and how the payments will be made. Terms for final payment. This will also define any penalty and interest for late payments. Construction Schedule - The dates that the construction will begin and when the construction will be substantially completed by. This will also detail how the project schedule will be divided. Contract Document List - Any drawings, blueprints, exhibits, or other documents that are part of the contract. Construction Scope - A description of all construction activities that will be part of the project. Conditions & Responsibilities - Details responsibilities for the owner and contractor, including who is responsible for providing certain documents and information. Contract Laws - Details the governing laws, lien requirements, claims procedures, arbitration procedures, insurance, and liquidated damages. A lump sum contract is the most common pricing arrangement for construction contracts. It is also known as a “fixed price” contract. In a lump sum contract, the parties agree to one price based on the contractor’s estimate of the total costs of the project. A lump sum contract includes all the materials, labor, subcontracts, profit, and all other related costs. Lump sum contracts can include incentives for early termination and penalties for late termination. Lump sum contracts are used when the owner wants to transfer risk to the builder and avoid change orders for unspecified work. A cost-plus contract is an agreement for the owner to pay for all the costs associated with a construction project plus an additional fixed fee for a profit margin. This means that the owner will first pay for all the actual costs incurred during construction such as costs for materials and labor. The owner will then pay the contractor an additional agreed upon fee, which is usually either a flat fee or a fixed percentage that is based on a percentage of the total costs. Cost plus contracts are used when the scope of work is not clearly defined. It becomes the owner’s responsibility to establish some limits on how much a contractor bills. In a unit price construction contract, the parties set a price for every unit of work. A unit price contract can be based on hours, linear feet, cubic yards, or by item. Unit price contracts are often used by federal agencies. Unit price contracts allow an owner to set prices during a bidding process by requesting specific quantities and pricing of a set number of items. Time and material contracts are used when parties agree to pay a predetermined rate for a unit. These contracts are used when it is not possible to present an accurate estimate or when it is difficult to define a schedule. A time and materials contract is the riskiest type of contract for the owner and the most secure type of contract for the contractor. 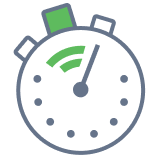 A time and materials contract should specify labor costs, material mark-up, not-to-exceed or maximum amount charged, and maximum labor hours.